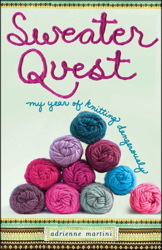 Guess what, my lovelies…Adrienne Martini, author of Sweater Quest, will be in our store June 30th at 2:00 pm. 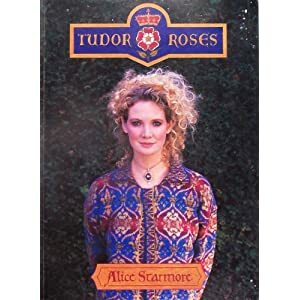 She plans to read an excerpt, sign books and hang out to talk about her year long adventure with knitting Alice Starmore’s Mary Tudor sweater. She’s even going to bring her Mary Tudor with her so we can all see it up close. As noted in previous posts, I am a structuralist when it comes to knitting. I love Aran stitches. Reverse cables are my idea of a good time. Charting out a 19 strand, asymmetrical braid with random crosses makes me giddy with joy. But color? Folks, I gotta tell ya…the thought of all that color work makes my head swim. I can hold two colors in my head at the same time and I’ve been know to enjoy a self-striping sock yarn on occasion. Mary Tudor would drive me to distraction. Yet, there’s something oddly compelling about it. And reading Adrienne’s book inspires me to make a long term commitment to something hard, and worth it. I’ll be looking forward to talking with Adrienne and contemplating all that color. Maybe I’m entering a new knitting phase; color anyone?